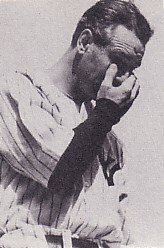 Gehrig wipes tears during his retirement ceremony. July 4, 1939. More widely celebrated as Independence Day in America. But at Yankee Stadium, approximately 62,000* people were celebrating Lou Gehrig Appreciation Day, Gehrig's official retirement gala. The doctors of Mayo Clinic had released his ALS diagnosis to the public on June 19, 1939. Since then there was an public push to honor Gehrig. The idea of an appreciation day reportedly began with Bill Hirsch, a friend of sports columnist Bill Corum. Corum spoke of the idea in his column, and other sportswriters picked up on the idea, promoting it far in wide in their respective periodicals. Someone(s) suggested the appreciation day be held during the All-Star Game, but when Yankees owner Ed Barrow got a hold of the idea, he quickly shot down the All-Star Game suggestion. He didn't want Gehrig to share the spotlight with any other all-star. Believing the idea was valid and the best thing to do, he wanted the appreciation day to be soon, and that day turned out to be July 4, when the Yankees were playing a doubleheader against the Washington Senators. The public was ecstatic, and former Yankees, namely the '27 team, from every nook of the country vowed to be there for Gehrig on his big day. Lou Gehrig Appreciation Day ended up being Gehrig's retirement party. In attendance were Mom and Pop Gehrig, Eleanor Gehrig (wife), and all the 1939 Yankees with manager Joe McCarthy. Other guests included Bob Meusel, Bob Shawkey, Herb Pennock, Waite Hoyt, Joe Dugan, Mark Koenig, Benny Bengough, Tony Lazzeri, Arthur Fletcher, Earle Combs, Wally Schang, Wally Pipp, Everett Scott, New York Mayor Fiorello H. LaGuardia, US Postmaster General James A. Farley, and the New York baseball writers dean and MC for the ceremony Sid Mercer. Babe Ruth showed up late, as was his typical fashion, and drew a loud cheer from the crowd. Gehrig was touched that there were so many people there on his behalf, but he had mixed emotions about Ruth being there. The two, once good friends, had not spoken in years. (See Relationship with Babe for more information). 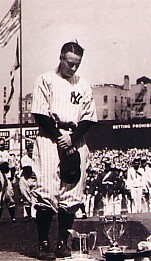 During the first game, Gehrig stayed in the Yankee dugout anxiously awaiting the ceremony that would take place at home plate at the end of the game. Similarly Joe McCarthy was fretting over the words he would say to Gehrig during the ceremony. Neither man thought himself articulate, and neither looked forward to having so many eyes on them. Whereas Gehrig decided to do the best he could with the impending ceremony, McCarthy was so nervous he became irritable. But he still had presence of mind enough to notice how frail Gehrig looked, and he pulled some of the Yankees players aside and told them to watch Gehrig during the ceremony in case he should start to collapse. Finally the first game was over and workers set up a hive of microphones behind home plate. The Yankee players of the current year and yesteryear lined up along the foul lines. Gehrig was placed near the microphones. A line of well-wishers from various occupations and fame came to the mics to say sweet, sweet things to Gehrig and about Gehrig. Some tears escaped from his eyes while he nervously, humbly hung his head and made a small circle of impressions in the dirt with his spikes. He took every word said to heart. Ruth was one of the notable speakers. Back in the early '30s, when Ruth's prowess was dwindling while Gehrig's was ever-increasing, Ruth had made derogatory remarks about Gehrig's consecutive games streak, suggesting that Gehrig needed to learn to sit on the bench or go fishing (one of their common loves). In his speech on Lou Gehrig Appreciation Day, Ruth again suggested Gehrig pursue fishing, but this time he was trying to encourage Gehrig rather than shame him. McCarthy came to the mics to say his piece with limbs trembling just as much as Gerhig's. Despite his uneasiness, McCarthy was as heartfelt as he could manage, fighting the urge to bawl like a baby out of respect to Gehrig's shaky emotions. Because McCarthy and Gehrig were very close, almost a father-son relationship, McCarthy knew that if he started crying it would probably make things that much worse for Gehrig trying to get through the ceremony. The most memorable part of his speech was when he assured Gehrig that no matter what Gehrig thought of himself, he was never a hindrance to the team. And all that we've left unspoken. - Your Pals on the Yankee Team"
This trophy, though valued in 1941 to be worth $5, was one of Gehrig's most prized possessions. When it was Gehrig's turn to speak, he became very flustered from emotion and fear. Initially he had Sid Mercer speak on his behalf. "Lou has asked me," Mercer said into the mics, "to thank all of you. He is too moved to speak." With that, Gehrig started to walk off the field with McCarthy escorting him, and the microphones were about to be disassembled. But the crowd rose to its feet and chanted emphatically, "We want Gehrig!" And Gehrig knew he had to say something, so he turned around and headed to the plate. McCarthy was surprised by the reversal of decision and saw him to the plate. The workers undid any disassembling they had started and backed off for Gehrig to slide in behind the mics. The crowd cheered loudly as Gehrig mustered up the courage to face his fear of speaking to so many people while experiencing so much emotion. He held up his hand to request silence from the crowd and began to speak - without notes - what would be the most famous baseball player retirement speech in history. "Fans, for the past two weeks you have been reading about a bad break I got. Yet today I consider myself the luckiest man on the face of the earth. I have been in ballparks for 17 years and have never received anything but kindness and encouragement from you fans. Look at these grand men. Which of you wouldn't consider it the highlight of his career just to associate with them for even one day? Sure, I'm lucky. Who wouldn't consider it an honor to have known Jacob Ruppert; also the builder of baseball's greatest empire, Ed Barrow; to have spent six years with that wonderful little fellow, Miller Huggins; then to have spent the next nine years with that outstanding leader, that smart student of psychology - the best manager in baseball today, Joe McCarthy? Sure, I'm lucky. When the New York Giants, a team you would give your right arm to beat, and vice versa, sends you a gift - that's something! When everybody down to the groundskeepers and those boys in white coats remember you with trophies - that's something. When you have a wonderful mother-in-law who takes sides with you in squabbles against her own daughter - that's something. When you have a father and mother who work all their lives so that you can have an education and build your body - it's a blessing. When you have a wife who has been a tower of strength and shown more courage than you dreamed existed - that's the finest I know. So I close in saying that I might have had a tough break; but I have an awful lot to live for." He began to back away, then remembered his manners and quickly added, "Thank you." Applause, applause, applause, for nearly two minutes. Gehrig was visible shaken as he stepped back from the mics. He took out his handkerchief and wiped the tears away. Babe Ruth came over to hug him. And the emotions continued for Gehrig. He would not settle down until he had his wife with him within the safe, private confines of their home. His speech has often been called the Gettysburg Address of baseball. Eleanor Gehrig revealed in her autobiography that he had spent the previous night working on his speech, writing it down, but never rehearsed it "because it was simple enough and agonizing enough and he was still shy enough, groping for some way to phrase the emotions that usually were kept securely locked up." His career was officially over, but that didn't stop him from setting milestones. Gehrig was the first player of any sport to have his jersey number retired. Gehrig was also the first baseball player to have Cooperstown look the other way when it came to the mandatory waiting period between retirement and induction into the Hall of Fame. Gehrig was inducted the same year he retired, in December 1939, by a unanimous vote. *sources differ on the number of fans in attendance. Eleanor Gehrig says 70,000; Richard Bak says 61,808; Ray Robinson says 62,000. So it's anybodys guess exactly the number of people packed in the Stadium. Want to see and hear Lou Gehrig Appreciation Day? The YES Network's Yankeeography on Lou Gehrig includes the most footage of that special day than any other source. It also includes all of the clips of Lou Gehrig's famous speech known to historians (a full-length copy of his speech does not exist - to find out why, read Frequently Asked Questions About Gehrig). Click the picture below to buy a copy of Gehrig's Yankeeography!